The total number of apps people are using hasn't changed much over the past few years. 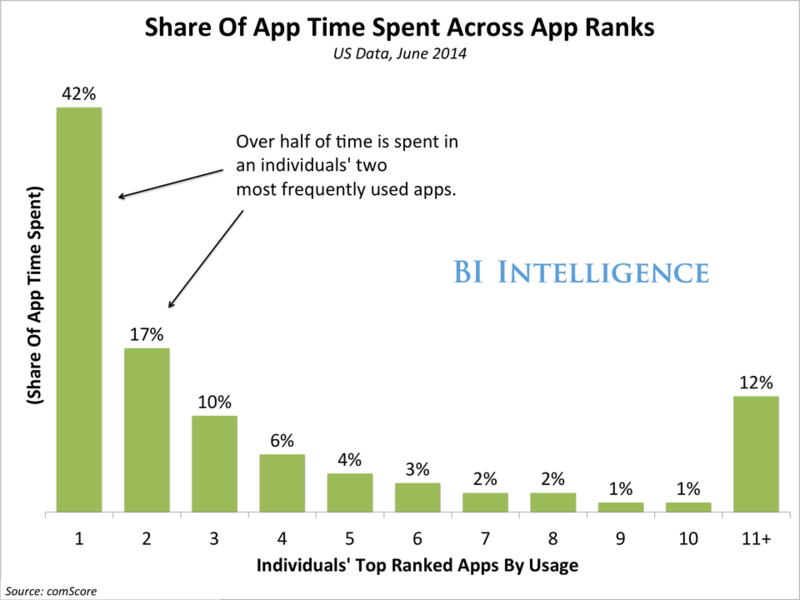 This means users are consolidating their app choices, and spending more and more time with a few favorites. This creates added pressure to stand out in the app stores, and develop apps that can gain and keep a loyal audience. In a recent report from BI Intelligence, we discuss why it is becoming increasingly important that developers field a competitive app-marketing strategy for triggering downloads and encouraging sustained use, and retaining users. There are a number of different tactics, both paid and free, that marketers might use. Per-capita downloads are stalling: US app users downloaded an average of 8.8 apps per month during 2014. But, that's nearly identical to the average monthly download volume three years ago. Encouraging retention and usage remain challenging: In June 2014, the average user spent about 70% of app time in their three most-frequently-used apps. 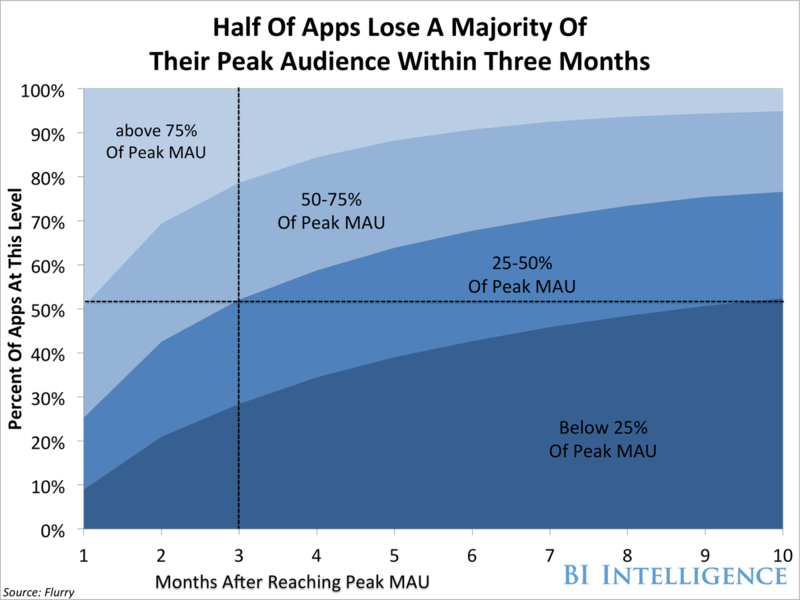 About 52% of all apps lose at least half of their peak users after three months. The cost of acquiring and retaining users is soaring. The iOS and Google Play app stores are overcrowded, and competition to stand out is at an all-time high. The cost-per-install on iOS soared 59% year over year in October, while the cost to retain a loyal user - defined as a user who opens the app at least three times in a two-week period - is even higher than acquiring a new one, and was up 33% year over year. User retention tips: Developers should focus on marketing their apps just ahead of major new phone or operating-system launches. App-marketing costs go up after a new device launches, because lots of apps are competing for the attention of consumers downloading apps to new phones. Apps that are top of mind among users when they first get their phone are likely to retain an advantage, without paying a premium for post-launch promotion. The rise of app-install ads: App-install ads have become a popular way to drive new downloads while other app-store optimization (ASO) tactics can help increase visibility through unpaid means. We detail these, and other strategies. To retain users who already have an app, in-app messages and offers are often effective. For example, a gaming app might push a user a message offering them a one-time deal on extra lives so they will continue playing. For full access to all BI Intelligence's charts, data, and analysis on the mobile and Internet of Things industry, sign up for a risk-free trial. A VC Tweeted Out A Math Problem Aimed At 11 Year-Olds - Can You Solve It? 5A VC Tweeted Out A Math Problem Aimed At 11 Year-Olds - Can You Solve It?